I always look forward to this time of year for the asparagus. Yes, it is available here all year round, but the rest of the year it’s often shipped in from far, far away, which is no substitute for fresh, locally grown asparagus. So this time of year I eat as much asparagus as I can stand, because I know the bounty is short-lived. One of my favorite ways to eat it is steamed with a boiled egg. When it’s finished off with a light, lemony, olive oil dressing, it is mouth watering and oh-so-yummy. 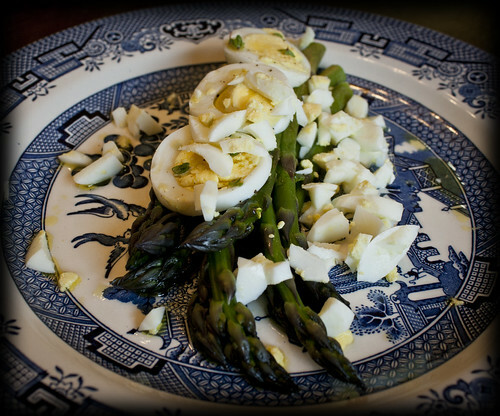 It is a perfect dish for a spring brunch. But it makes a simple, elegant addition to any meal at any time of day. I had mine for dinner the other night. This is for 2 servings. Place your eggs in a pot, cover them with water and boil until they are done. About 15-20 minutes. When they are done cooking, drain the hot water and place them in a bowl of cold water to cool. While the eggs are cooling…..In a small bowl, whisk together the olive oil, juice from the lemon, vinegar, salt, pepper and thyme. Set aside. Snap the dry, woody ends off the asparagus, rinse in cold water and pat dry. Cover the bottom of a saute pan with water, salt it pretty good and place the asparagus spears into the pan. Steam them for about five minutes by bringing the water to a soft boil. Then cover the pan, turn off the heat and let them set for about 5 minutes (or until they are at the crispness you prefer). Drizzle some dressing over top and enjoy. It’s great served with a slice of warm crusty bread. You can also sprinkle some fresh grated Parmigiano-Reggiano over the top if you have any. This past October I visited a local Alpaca farm with a friend who was visiting for a weekend. I ended up buying 2 hanks of absolutely gorgeous baby alpaca yarn that the farm owner had spun herself. It really is a treat to knit with. It is so soft and light and luxurious. 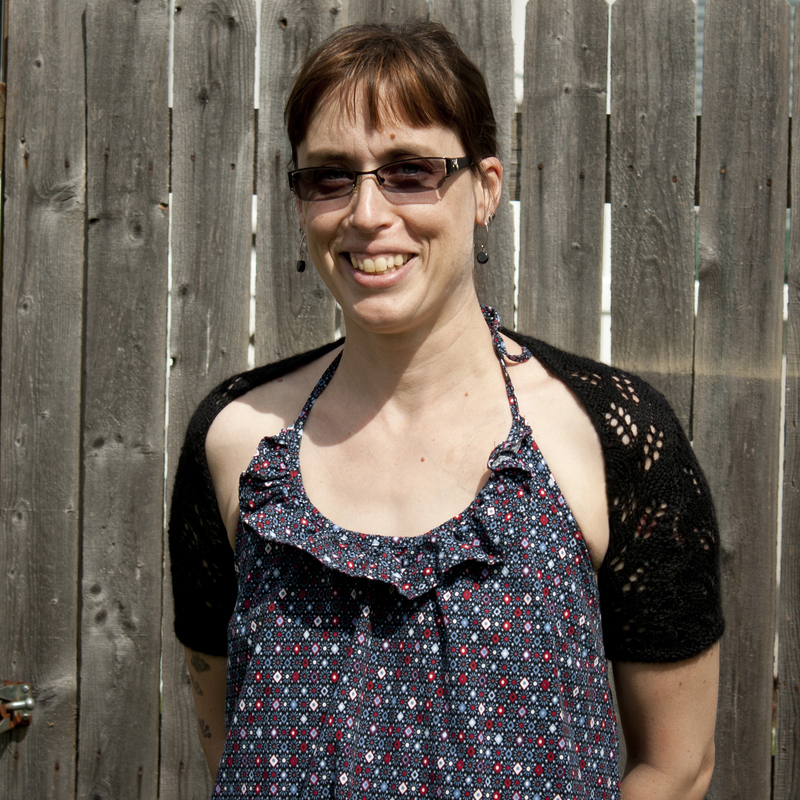 I searched for awhile for the perfect pattern for this yarn, when I finally found the Illyria Bolero on Ravelry. I liked the lacy pattern, it seemed like it would be something I could realistically knit with my skill set, and it seemed like a pattern that would showcase the yarn. The pattern was fun to knit and easy to follow. The fabric that resulted was beautiful. But I’m not so sure I like how it looks on me. I knit a medium. The sleeves fit fine, and the length is good since I wanted shorter sleeves for summer, but this yarn won’t grow enough in width to look like the picture on the pattern. And I’m not so sure how it will wear under the arms. 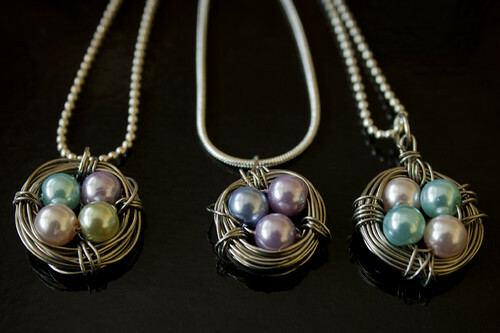 My husband asked, “What the heck is the point of wearing that?” I told him it has no point other than to look pretty. I didn’t want to admit that he was right and that I really thought it looked a little wonky. I’ve since blocked it twice more hoping I could get it to grow a bit to no avail. I don’t think I like it as a shrug. I do like the fabric though, and since I only used 1 of the hanks of yarn, I’ve decided to turn it into a scarf. I’ve undone the seams and cast-off edge and unraveled the final few rows of garter stitch. 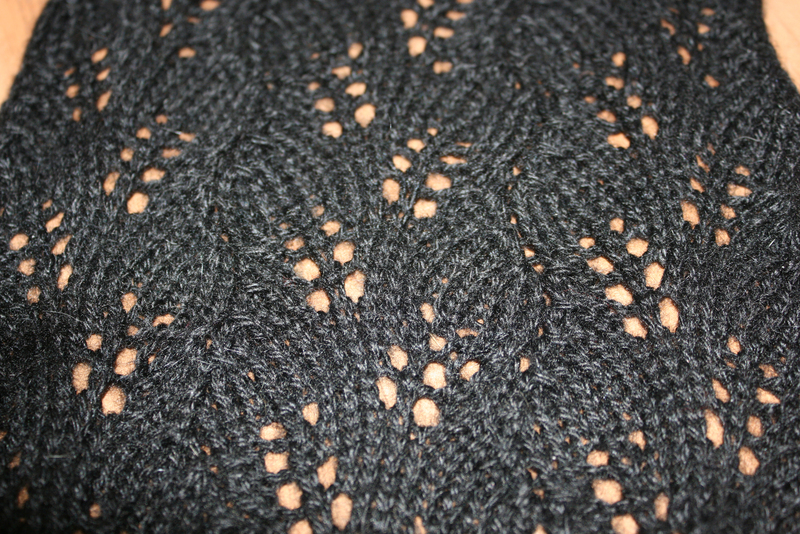 I will continue knitting in the lace pattern until I have a beautiful, lace scarf. I’ve fallen behind in my reading challenge for the same reason I haven’t been updating the blog much lately – life got really busy. It’s starting to slow down again to a less frantic pace, so hopefully I can catch up on my reading, knitting, and sewing. I seriously need to catch up on my sewing – there is a growing stack of clothing and toys that need repair, half-finished projects, and fabric that has been cut and needs to be sewn into wearable pieces of clothing. But back to the books…..
I’m going to do quick little reviews again of the books I’ve read since the last reading challenge post. A Handmaid’s Tale by Margaret Atwood: I don’t even know where to start with this review. Every time I sit down to write something short and concise to sum up the plot and my thoughts on it, I get so many thoughts rushing to the front of my brain that I can’t think of a coherent one to write down. To me that’s a good sign though. This book made me think a lot. Some of it I am still processing. The story is about a woman named OfFred. She’s typical of a modern American woman – has a family, career, friends, bank account and all the other rights and privileges that we all assume we should receive. Then the religious extremists take over and strip women of all their rights and possessions and even their names. (The handmaids are named Of + the name of the male they belong to.) Atwood explores what our country would look like if religious extremism is taken to it’s logical conclusion. I thought it was very well done. There was a lot of confusion in the book that left me wondering what exactly was going on and how it happened. Tt helped create a sense of urgency that kept the story moving forward. As the story unfolds, Atwood reveals the how’s and the what’s in a way that kept me engaged in the story and made me completely identify with the main character. It’s an unsettling story, especially given all the events lately regarding women’s healthcare. I think I would have found this book unsettling if I had read it when it was first published in 1986, but on a much different level. What I took away from the book is that rights are fleeting and we should not take them for granted or be too complacent in life. It was a book that will stick with me for a long time. Those are the best kind of books. House of Thieves by Kaui Hart Hemmings: I chose this book because it was a Kindle “deal of the day” and it contains the story Minor Wars, which inspired the movie and book The Descendants. I’ve not seen the movie or read the book yet, but the trailer intrigued me enough to be curious about the story behind it. I enjoyed this book. It is a collection of short stories about dysfunctional, upper-class, Hawaiian families. Not all the stories were great, but enough were that I kept reading. The characters are all complex and none of them had any real resolution to their stories – a lot like life. It offered a reminder of how complicated modern life can be. The stories made me uncomfortable, and they were a bit dark and unsettling, but most of them stuck with me and I had a hard time putting the book down. I am definitely looking forward to reading more of her work. The Wordy Shipmates by Sarah Vowell: I have to admit, I was a little disappointed in this book. It is about the Puritans of the Massachusetts Bay Colony and it draws parallels to modern day evangelicals and some current events. I was so excited to read it because this time period in our history fascinates me. I was also hoping that this would be a good book to bring some factual light to the mythological creatures that the Puritans have become in America in a way that I could recommend it to friends and family that normally find history boring. It is well researched, and there are a lot of interesting historical bits presented that most people probably don’t know about, but about half-way through the book it slowed down to an almost unreadable pace. She went off on so many tangents, and added so much detail about some of the figures, that I honestly got bored and lost in a few places. (And this is coming from someone who loves to read history books.) The end picked up again though, and I was able to finish it. I didn’t enjoy this book as much as some of her other books that I’ve read. I’m also not sure that I will be recommending it to too many others as I had originally hoped. Bite Me by Christopher Moore: The third book in Moore’s Love Story trilogy, where a large gang of vampire cats are threatening San Fransisco. It didn’t disappoint – it was funny, but not as good as the first two in the series. It was a great way to waste a lazy Sunday afternoon, though. Right now I am reading: Liars for Jesus by Chris Rodda, The New Organic Grower by Eliot Coleman so I can learn how to start up our future hobby farm, and Purple Hibiscus by Chimanmanda Ngozi Adichie. 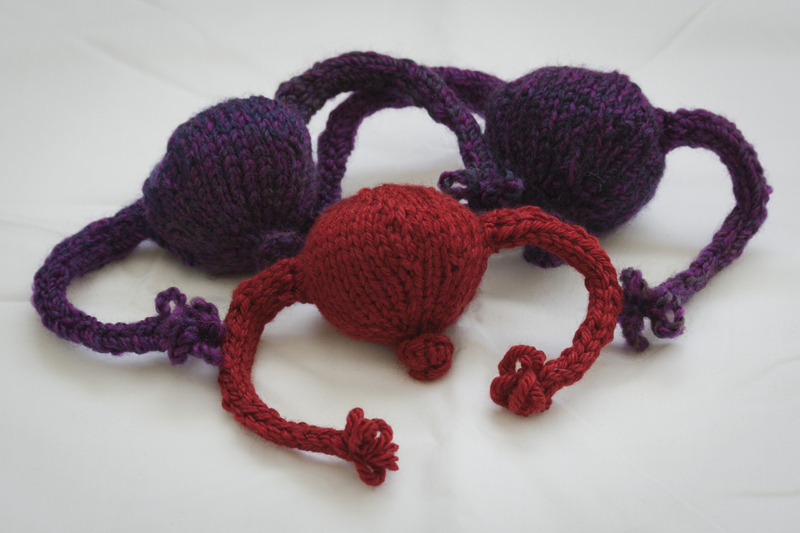 Here is my contribution to the cause: red and purple uteri, lovingly knit for my male Senators and Representative. I mailed them out this afternoon. I realize this is a gimmick and they will probably be thrown away, but sometimes gimmicks are needed to get the attention of those that need their attention grabbed – in this case, legislators who would like to take our country (and women’s rights) back to the Dark Ages. And anyway, it was fun and added a much needed sense of humor to this serious issue. You can find out more about the Snatchel Project here.